An all-electric taxi, left, waits at a pickup point in Tokyo's posh Roppongi Hills district Sept. 1, 2010. TOKYO (Reuters) -- Yoshihiko Takahashi chuckles politely when asked if he is weary of having the same conversation with passengers every day as he shuttles them around Tokyo in his white and blue all-electric taxi. How often do you have to recharge? How far can you go? Does this car really have no emissions? Those are just some of the queries he has grown used to during his 90-day trial use of three zero-emission taxis, and a designated battery-switch station in the first undertaking of its kind in the world. "For most people, it's their first time riding an electric car," Takahashi said. "I don't mind the questions." Conceived by California-based Better Place, a global provider of electric vehicles, and operated in partnership with the Japanese government and Nihon Kotsu, Tokyo's biggest taxi operator, the pilot program aims to test the feasibility of all-electric cabs using switchable battery technology as a way to reduce emissions and fuel consumption. After a successful first run, the program entered a second stage this month to further evaluate battery performance, driver behavior, and other metrics. If all goes well, Better Place hopes to convince a carmaker to mass-produce exchangeable-battery taxis for Japan's capital. The current test vehicles are converted Nissan Dualis SUVs, called Qashqai in some markets. Nissan is not involved in the scheme directly: an outside company has re-engineered the cars with batteries provided by U.S.-based A123 Systems. Better Place estimates that Tokyo's 60,000 taxis account for just 2 percent of vehicles on the road but are responsible for 20 percent of vehicle emissions. Moving those taxis to battery power will help the environment and might encourage the spread of electric cars to regular consumers, Better Place Japan President Kiyotaka Fujii says. 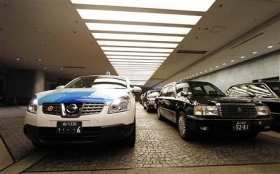 "Taxis have a touch point for consumers," he told Reuters. "Trucks don't induce a person's purchase decision. Taxis do. Once they catch on, I think it'll be quick." So far, the reaction from passengers has been encouraging. Of the 700 responses collected from in-car surveys in the three months to July, 97 percent rated their experience as positive. When asked whether they would prefer riding in an all-electric taxi over a conventional one, 70 percent of passengers said they would, while 80 percent said they wanted all taxis in Tokyo to become electric, according to Better Place. Takahashi, one of eight Nihon Kotsu drivers behind the wheel of the electric taxis, is also content with his ride. While the electric taxi's maximum range of just 62 miles on a full charge means it requires four or five battery swaps every shift, Takahashi said that hasn't stopped him from taking on as many passengers as he would in a normal taxi -- about 22 or 23 a day on average. "The car handles really well. It's extremely smooth -- much more so than the Prius that I normally drive," he said, referring to Toyota Motor Corp.'s hybrid, a popular choice these days for the city's taxis.